(CNN) -- Beneath an Antarctic glacier in a cold, airless pool that never sees the sun seems like an unusual place to search for life. Scientists find surprising evidence of bacterial life beneath the Antarctic ice near Blood Falls, seen here. But under the Taylor Glacier on the East Antarctic Ice Sheet, near a place called Blood Falls, scientists have discovered a time capsule of bacterial activity. At chilling temperatures, with no oxygen or sunlight, these newly found microbes have survived for the past 1.5 million years using an "iron-breathing" technique, which may show how life could exist on other planets. For years the reddish waterfall-like feature on the side of Taylor Glacier captured the attention of explorers and scientists. 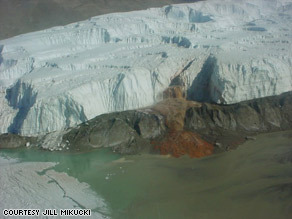 Earlier research indicates the color of Blood Falls is due to oxidized iron, but how the iron got to the surface of the glacier remained a mystery. Anderson Cooper & Dr. Sanjay Gupta take you to the frontlines of the ultimate battle over our natural resources. Scientists found these isolated microorganisms use iron leached from the glacial bedrock in a series of energy-producing metabolic reactions. With the help of sulfate, the iron is transformed and eventually deposited on the surface of the glacier. Air oxidizes the iron, giving Blood Falls its redish hue. "We don't fully understand the extremities of life: What cuts off life? What are the upper and lower temperatures limits? What are the parameters that life can handle?" said Mikucki, a geomicrobiologist at Dartmouth College in Hanover, New Hampshire. "Microbes really defy those limits and can get into the extreme environments and tell us a little bit about the natural history of our earth." Obtaining samples of the bacteria, however, was not an easy task. After years of attempts, Mikucki and her colleagues finally obtained an uncontaminated, clear sample of marine brine that was trapped about 400 meters underneath the glacier and about 4 kilometers from its snout, or lowest end. After analyzing the chemical composition of the salty liquid, isolating the microbes and analyzing their DNA fragments, Mikucki and her colleagues found several different kinds of microorganisms. Scientists believe they could be remnants of microbes from an open sea millions of years ago. "It's actually pretty stable and protected below these big ice sheets, and that is something life needs to evolve unique strategies [for survival]," said Mikucki. The findings open the possibility that life could exist in other remote parts of the universe, researchers said. "Perhaps the ice caps of Mars are actually protective, and that [kind of] life could exist below some of these ice-covered regions and on other planets," Mikucki said. "Organisms are highly adaptable to their environments. They are able to slow down as long as they get some energy," said Ann Pearson, co-author of the study and Associate Professor of Earth and Planetary Sciences at Harvard University. "The amazing idea is that life is everywhere, we just have to look for it," said Pearson.